When I run up against a person with a strong anti-Roman bias -- like the late Robert E. Howard, who championed the northern barbarians -- I feel an almost personal affront. Howard was always ambivalent in his regard for the Irish. In another letter to Preece, REH wrote, “Damn the Irish and damn the black Milesian blood in my veins that makes me like drift-wood fighting the waves and gives me no peace or rest waking or sleeping or riding or dreaming or traveling or wooing, drunk or sober, with hunger or slumber on me”. Again and again REH railed against the waywardness and instability that he saw in the Celtic psyche. “What has my Celtic blood ever done to me but give me a restless and unstable mind that gives me no rest in anything I do”? Obviously, despite Robert E. Howard’s heart-felt pride in his Irishness (the true extent of that Irishness is something Patrice Louinet is researching even now), he didn’t view Erin nor her children through green-tinted glasses, at least not in every instance. One can see this ambivalence reflected in Robert E. Howard’s Gaelic heroes. Cormac Mac Art never set foot in Ireland in any of the yarns that have come down to us, nor did he ever express a desire to do so. Whether this was a purely voluntary decision or the result of exile (a far more common punishment under Brehon law than execution) is never really stated by REH. As for Turlogh O’Brien, we know he was an outlaw, but there still seems to be a hint, in my opinion, of a love/hate relationship with the Auld Sod in O’Brien’s case. 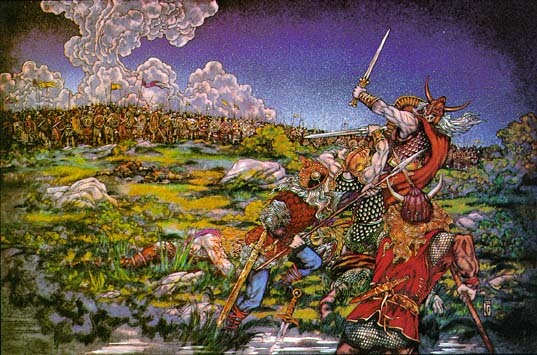 Howard’s Norman-Gael hero, Cormac Fitzgeoffrey, was a pariah and wolf’s-head in the land of his mother’s folk. Red Cahal (of “Sowers of the Thunder”) is another Irish expatriate. Contrast the situations of the Gaels above with Solomon Kane’s passably good relationship with Devonshire and the rest of England. Howard seemed more comfortable setting his yarns in England (and ancient Britain) and Scotland than he did placing tales in Eire, past or present. By my count, Robert E. Howard set three completed yarns in Ireland: “The Grey God Passes”, “The Cairn on the Headland” and “Dermod’s Bane.” Compare that with all the stories REH set in England and the entire isle of Great Britain. In fact, by my rough estimation, it appears that Howard set more of his tales in England than the Anglophilic Lovecraft ever did. This can’t have been because REH felt more “familiar” with the Green and Pleasant land. He seems to have studied Irish geography and history fairly thoroughly. Meanwhile, in “The Lost Race,” Howard bequeathed to Iron Age Cornwall a range of mountains with as much geographical reality as Lyonesse. There seems to have been something keeping him from writing yarns set in the Emerald Isle, and I can’t believe that it was due to purely “commercial” concerns. Writers like Byrne, Shaw and Joyce were doing just fine writing about their homeland. Robert E. Howard extended this ambivalence all the way back to the Hyborian Age. 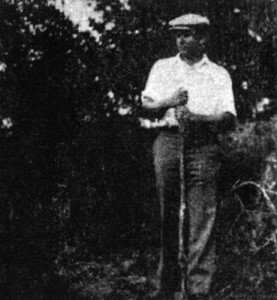 In a letter to Preece from 1929, REH wrote this about the Irish heart: “The fall of an empire and the slaughter of millions may not shake it, but the drifting of a leaf before the wind or the song of the wild geese, or the moonlight on a still bay may shiver it into a million shining shards.” Compare that with this line from the first submitted draft of “The Phoenix on the Sword,” where Conan is referring to his fellow Cimmerians: “I have seen the strange madness of futility fall upon them when a little thing like a spinning dust-cloud, or the hollow crying of a bird, or the moan of the wind through bare branches brought to their gloomy minds the emptiness of life and the vainness of existence.” In that same draft, Prospero notes that he never heard Cimmerians sing, “save to chant dismal dirges.” A bit later, Conan states that,”Only in war are the Cimmerians happy.” Compare those lines with this bit of verse from Chesterton’s “The Ballad of the White Horse”: “For all their wars are merry and all their songs are sad.” Chesterton is referring to the “Great Gaels of Ireland.” As Leo Grin just noted in his blog post, Chesterton was a Howard favorite. I don’t think it is going too far out on a limb to say that “The Ballad of the White Horse” was probably Robert E. Howard’s favorite poem by Chesterton. Howard never wrote a tale about Conan returning to Cimmeria. When Conan finally opted for a land in which to ‘settle down’ (such as he was capable of), he chose Aquilonia, not Cimmeria.